The quality of trust goes to the heart of whether we feel safe inwardly, and whether we are willing to play our part to keep others safe also. It uniquely reflects whether we believe – and can trust – that our lives matter. And that what we do and how we think also matters. In this accessible, deeply encouraging talk, Dr Stephanie Dowrick reflects on this essential quality. 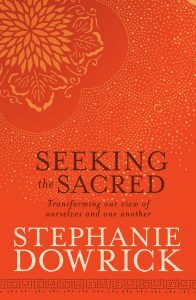 She opens with a memorable reflection on a deceptively simple prayer from Zen monk, Thich Nhat Hanh. The talk was recorded at the monthly interfaith services Stephanie leads at Pitt Street (264) Uniting Church, Sydney, on 15 April. (3rd Sunday of each month; 3pm). Please leave your comments or experiences of this or any of Dr Dowrick’s YouTube talks on her “Official Stephanie Dowrick” Facebook page. You are also able to share your experiences there with others who follow Stephanie Dowrick’s writing and teaching.